Pissis was born in Guaymas, Mexico in 1852, but his family moved to the scrappy town of San Francisco when he was around six. He gradually rose from a designer of rather typical Victorian homes to become a force in local architectural circles. He helped bring a sense of order learned at the Ecole des Beaux-Arts in Paris at a time of architectural chaos in the young metropolis. In addition to his work, including landmarks like the Flood Building and the Hibernia Bank, his client and personal relationships have intrigued me. But Pissis is hard to research. His office files burned in the 1906 earthquake and fire. 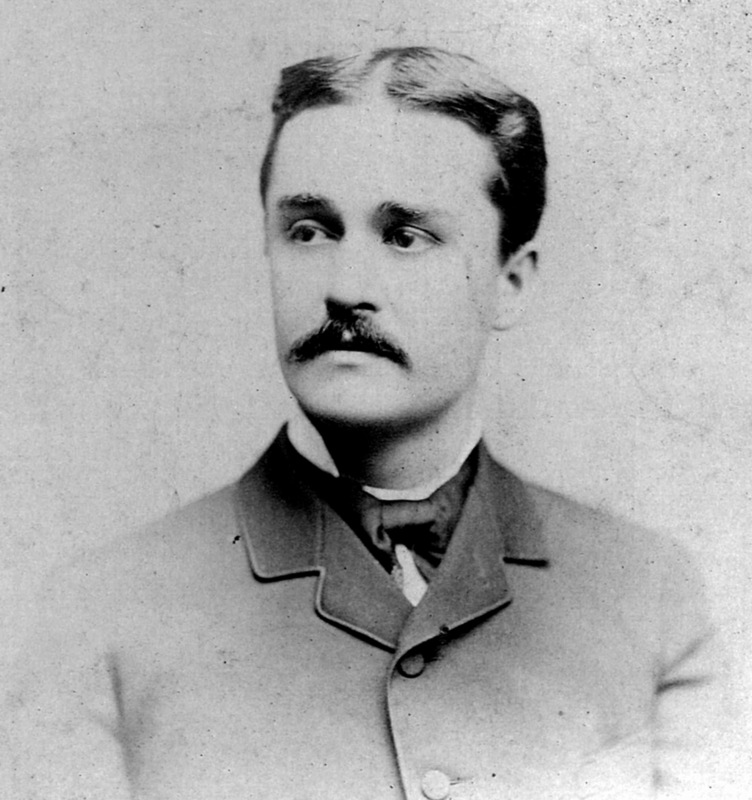 The firm’s work post-fire was considerable but those records, passed on after Pissis’ death in 1914 to his successor, Morris M. Bruce, cannot be found. Pissis was the oldest of five children born to a French physician and his Mexican wife. One aspect of his life that is murky was his relationship with his brother Emile, who was two years younger. Emile also had a creative gene, and became an artist. But they rarely worked together, even in an era of growing appreciation for the arts and culture in a city that was keen on labeling itself as the Paris of the West. While researching an article on Pissis and the Hibernia Bank for the San Francisco Historical Society’s journal, The Argonaut, I began to wonder if Albert and Emile had a falling out later in life. The two must have been close, at least in their early years and part of their adult life. But even though Emile was a talented artist, it has struck me as odd that they worked on only a few known projects together: a home in Pacific Heights, and the temple for Congregation Sherith Israel on California and Webster streets, completed in 1905. Emile designed many of the art glass windows for the Byzantine-Romanesque temple. 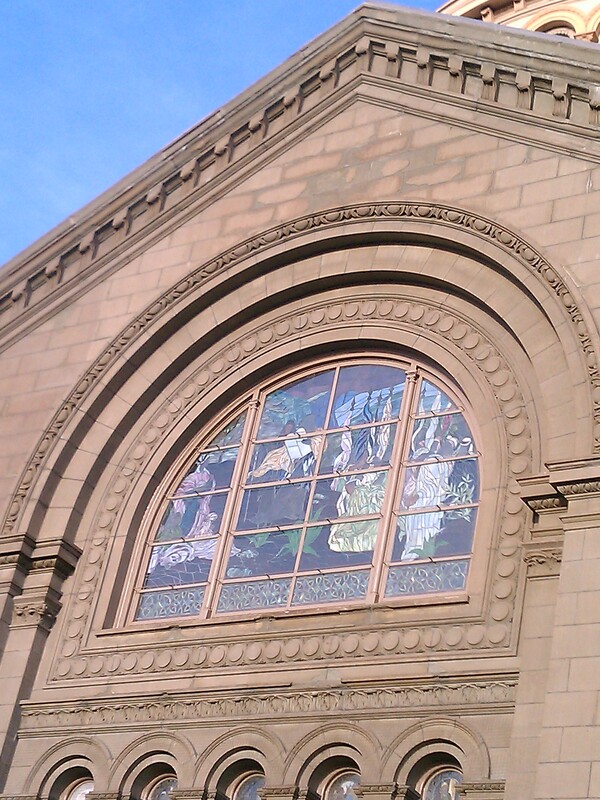 The windows are now more visible (see photos) as a result of a major renovation and seismic retrofit, which has also included removing the salmon colored paint and restoring the building’s Colusa sandstone exterior. The dome is next on the list for paint removal. Historians only re-discovered Emile Pissis’ involvement in the temple several years ago, after finding a receipt for payment to him for the art glass windows in the Sherith Israel archives. Emile is not mentioned in any newspaper articles at the time of the September, 1905 opening of the temple. Albert Pissis is cited as the architect, along with frescoes by artist Attilio Moretti. 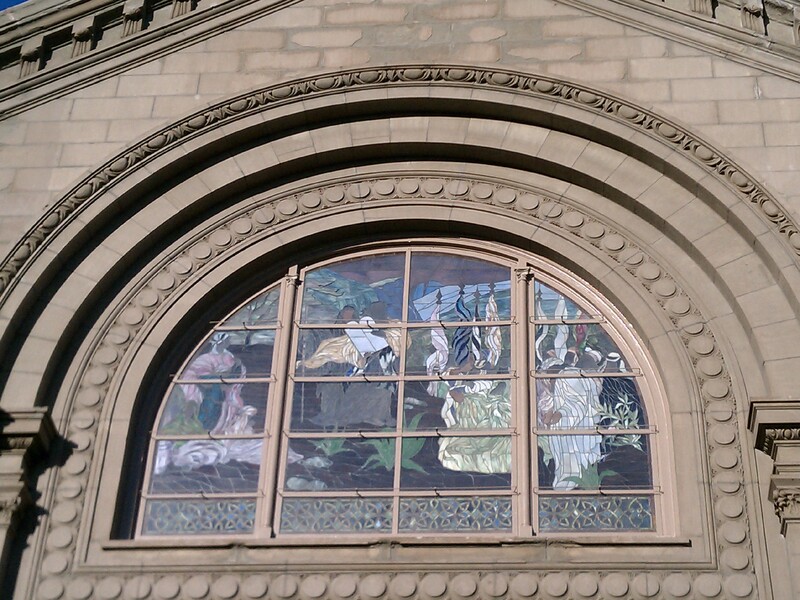 An excellent doctorate dissertation on Pissis and Arthur Brown, Jr. in 1986 by historian Christopher Nelson discusses Emile’s art glass windows. Emile studied art in Paris, while Albert was studying architecture at the Ecole. Upon their return to San Francisco, Emile worked for about 16 years at various importing firms, as a clerk and then a bookkeeper, possibly through connections in the French community. 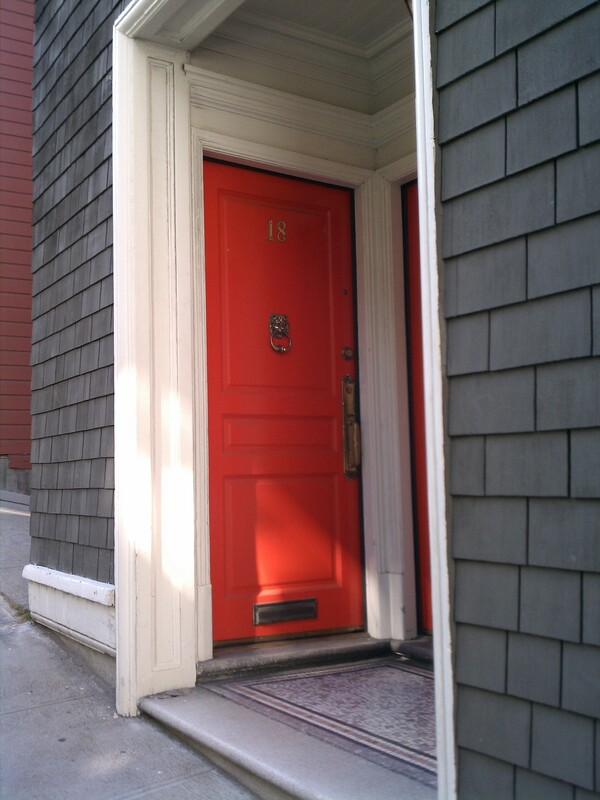 Based on listings in San Francisco City Directories, around 1888, Emile was able to stop working, perhaps aided with his share of his father’s estate, and focus on his art. In 1890, Emile returned to Paris for a few more years. By January, 1894, he was back in San Francisco, and mentioned in The Morning Call as one of 10 local artists, including Arthur Mathews, who were contemplating sending their work to exhibit at the Midwinter Fair in Golden Gate Park. He was living in the family home, by then on California Street and listed as “artist” in the city directories. Emile Pissis did not agree. In an article in the San Francisco Call on February 15, 1895, he complained about the poor lighting in the dark hallway of the mansion, the exhibition space for the artists who were students at the Art Association’s California School of Design. Pissis said he had shown a large number of paintings in a previous exhibit but that they were “killed” by the shadows and he would not exhibit again. Despite Emile’s protests about the dark gallery space, he did show his work again. In 1896, he placed third behind local legends, Arthur Mathews and William Keith, first and second prize winners, respectively, in a contest commissioned by James Phelan for scenes from California’s history. 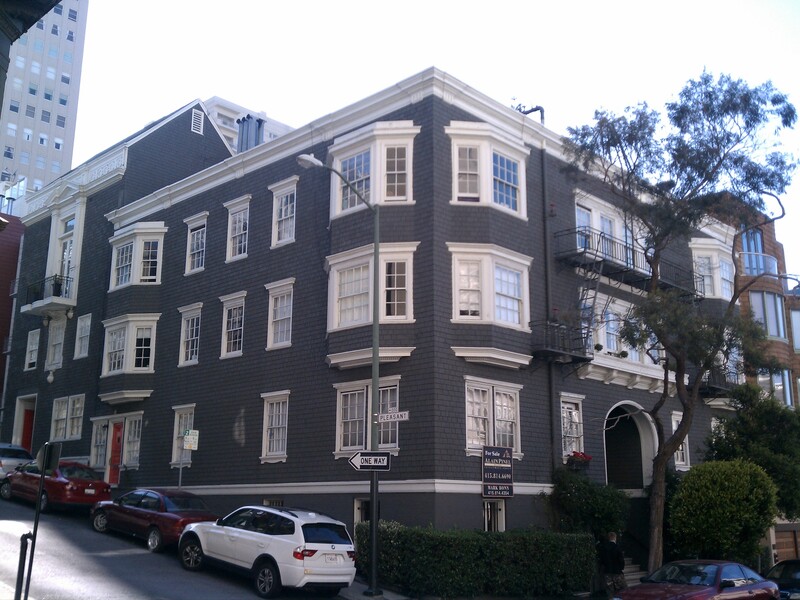 In what appears to be the last collaborative effort with his brother Albert, in 1895 Emile commissioned Pissis & Moore to design an apartment building on the corner of Pleasant and Taylor streets on Nob Hill. Their father Joseph had dabbled in real estate, and his sons inherited his aptitude. Emile’s art studio formed the penthouse of a building consisting of three flats, with its own separate entrance on Pleasant Street. The entire building cost $8669, according to California Architect & Building News in 1895. Sadly, no drawings of the building Albert Pissis designed for his brother have been found. 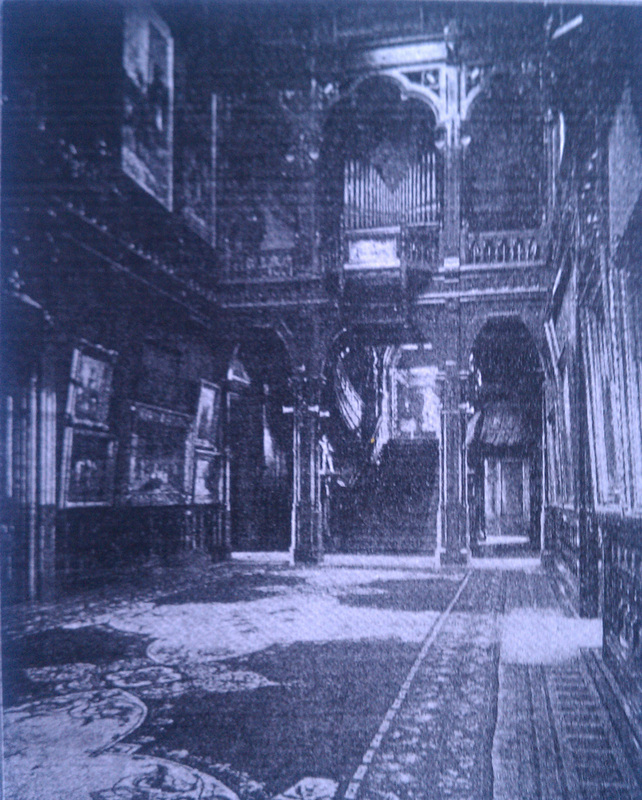 The building burned in 1906, along with most of Emile’s paintings at the time. During the city’s rebuilding, Emile enlisted the young firm of Bakewell & Brown, now known for their neo-Baroque splendor that is San Francisco City Hall. Their 1909 building stands today at the corner of Pleasant and Taylor. Emile lived the rest of his life at No. 18 Pleasant Street, with rentals providing him with a mostly steady income. This building also nearly burned down: in 1933 a fireman had to smash down two doors to rescue the elderly Pissis in his penthouse from a raging fire. Why didn’t Albert design the second iteration of Emile’s apartment building and art studio? Perhaps he was too busy during the post-1906 building boom, where he played a major role designing many downtown business buildings and new stores for the city’s retailers like the White House. He perhaps recommended the young architect Arthur Brown, Jr. if he had no time to help his brother. But an interesting fact has emerged about Emile. He wrote many “Letters to the Editor” of The Argonaut, the weekly literary paper, under a pseudonym, Lemice Terrieux II, a play on le mysterieux, which means the mysterious one in French. The Argonaut wrote a brief obituary of Emile Pissis, in which the editors unveiled his true identity, and said he had been writing for the weekly for 40 years. But the first letters that could be found signed Lemice Terrieux II are from the late 1920s, in which he opined about everything from politics to Prohibition to the economy to the local art scene. “These were the educational grounds of the youths of those days, where they became sophisticated sexually,” wrote Lemice Terrieux II, on August, 3, 1929. Another article on August 24, 1929 is even more interesting for what it says about Emile’s view of his brother’s contribution to San Francisco’s architecture. Looking back fondly on the old days, he cast a rather disparaging eye on some of his brother’s most important buildings, including the 1892 Hibernia Bank that propelled Albert’s career. Written near the end of the city’s Jazz Age skyscraper building boom, Emile blamed some of his brother’s works for ushering in a “Stone Age” of granite buildings and ending the city’s quirky architectural mayhem in wood and iron. Were these just the idealized reminiscences of an old man, or did Emile express them to his brother while he was alive? It is perhaps worth noting that when Albert Pissis died, he left his entire estate to his wife, Georgia Pissis, whom he married in 1905. His estate, estimated at around $500,000 in 1914, was large especially for an architect, and the Architect & Engineer said he was the city’s wealthiest architect. Pissis, like his father, had also amassed local real estate holdings, stocks and bonds, and even had a chauffeur. But neither of Albert Pissis’ three living siblings at the time of his death, Emile, his other brother Eugene, and Margaret Gallois, nor his sister’s children, were mentioned in his brief wills, one dated 1908 another dated 1911. Of course, it’s standard to leave an entire estate to one’s spouse. But the will’s complete omission of Albert’s younger artist brother and other family members, is still an interesting, if puzzling, fact.